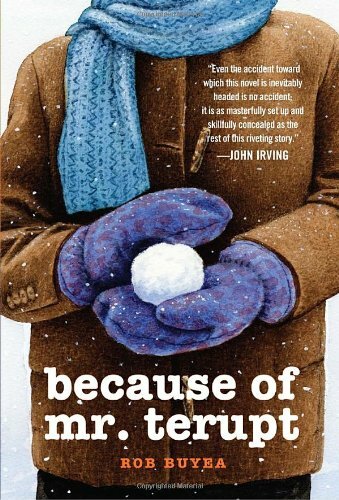 Overview: Because of Mr. Terupt is a realistic fiction novel written in the first person from the perspective of seven students in Mr. Terupt’s 5th grade class. Mr. Terupt is a new teacher at Snow Hill School, but the students quickly learn that he is a special teacher. The book is separated into two parts. In Part One, we get to know Mr. Terupt through the eyes of seven of his students. Part Two begins after a tragic accident at school. After the accident, the class copes with their teacher’s condition and their role in causing the accident. The accident brings the class together and teaches each of the seven main characters an important lesson. This novel can be a great tool to teach narrator’s voice, point of view, figurative language, foreshadowing, and themes of change, forgiveness and personal responsibility. This upcoming school year, I’ll be using Because of Mr. Terupt as a novel study in one of my realistic fiction book clubs. Since I didn’t find a guide that met my needs, I created my own. Click HERE to view and download my free guide. This guide contains vocabulary, figurative language, and comprehension and inference questions for each section. Graphic organizers are also included and can be accessed within the pdf. A suggested sequence is provided with the guide. The assignments in bold show the chapters I’ve intentionally chosen to read with this realistic fiction reading group. 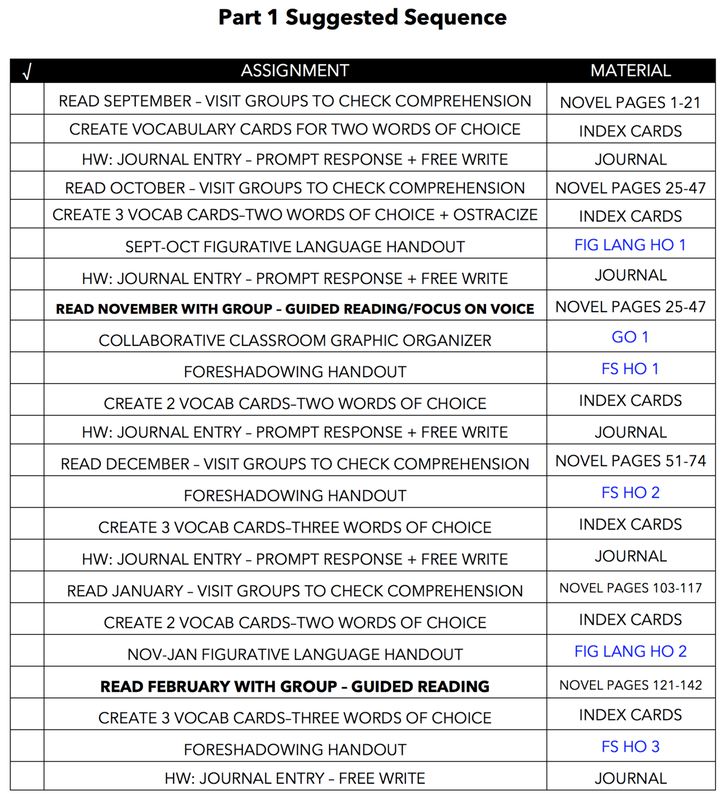 When you schedule your guided reading sessions, I recommend you schedule to meet with your students on the bolded assignment days. Areas highlighted in blue indicate that a resource is included within the pdf (blue page numbers refer to the pages in the pdf, not novel pages). This novel has been broken up into 10 sections. Each section is limited to one page to keep it easy-to-use. A chapter summary, vocabulary list, list of figurative language, as well as comprehension and inference questions are included in each section. Also, a page number is included for each vocabulary word and sentence of figurative language to make it easy for you to find in context. 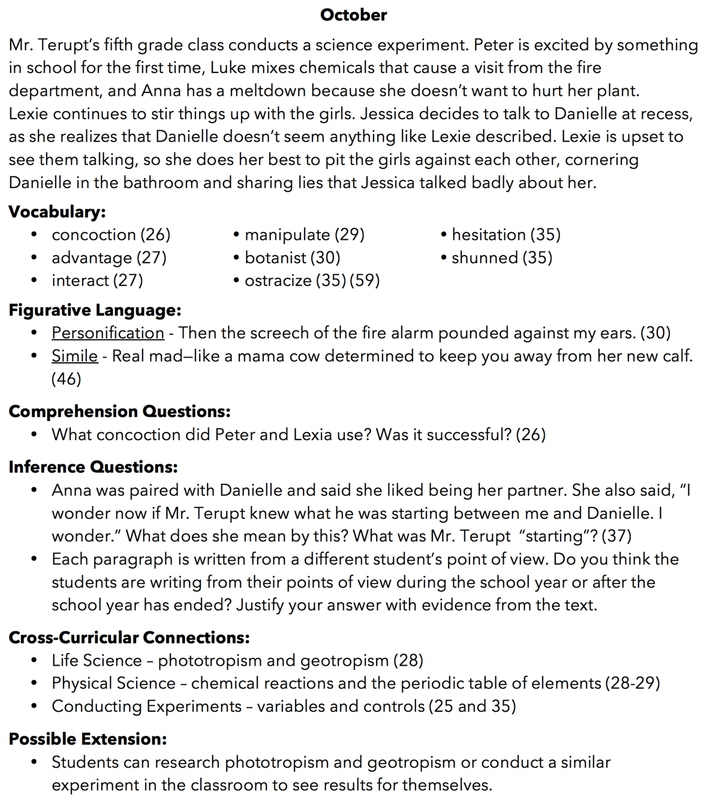 Page numbers are included for the comprehension and inference questions as well. The guide includes several optional assignments that target figurative language, foreshadowing and comprehension. Click HERE if you’d like to view or download my guide. I hope you find it helpful! ← Have You Discovered BiblioNasium Yet? When you click the link in the post, you will see a blue “download” button in the upper righthand corner when the page loads. You have to download the document before you are able to print it. I hope this help! Thank you for the great resource! Thank you for sharing! Looking forward to using this with my 5th grader. This is fabulous & very generous of you to share! Thank you so much! This is fantastic! I’m going to be using some of your ideas through Google Classroom for this novel study. Really great work! Thanks for sharing! Exactly what I was look for! Thank you! I’d like to download this document, but it won’t download for me. I have Dropbox and have signed in, but it’s still unsuccessful in downloading it. Anyway you could email it to me or help Me? Thank you. I’d really love to use this because I was going to start reading this book when break was over. I can email it to you. Send me your email address and I’ll shoot it over to you. I’m currently on vacation and unable to send right now, but I’ll be sure to do it when I return in Tuesday. Thank you for such an amazing resource… and free!! You are very kind to share this. Feel confident in knowing you are helping today’s teachers grow successful learners! I am a volunteer in the New York City Public schools, and am currently leading a 5th grade reading group that meets weekly during the student’s lunch period. There are six in the group, all reading at or above grade level. We just finished “The Phantom Tollbooth” which they (and I) loved, and our next book is “Because of Mr. Terupt.” This was a recommendation from another young boy that I encountered in a book store who, when I asked him what books he has read and liked, led me straight to this one. Always good to get a peer review! I discovered your blog while searching for some suggestions about how to proceed, and was delighted to come across your page. Thank you for your generosity in sharing this! You must be a wonderful teacher! Thank you, Judy! I hope you enjoy the book. My students always love it, but it particularly hooks students who are reluctant readers. Enjoy! Click HERE to view my flip videos and other video resources for students. © Celeste Caso and 5th Grade Files 2014-2015. Unauthorized use and/or duplication of this material without express and written permission from this blog’s author and/or owner is strictly prohibited. 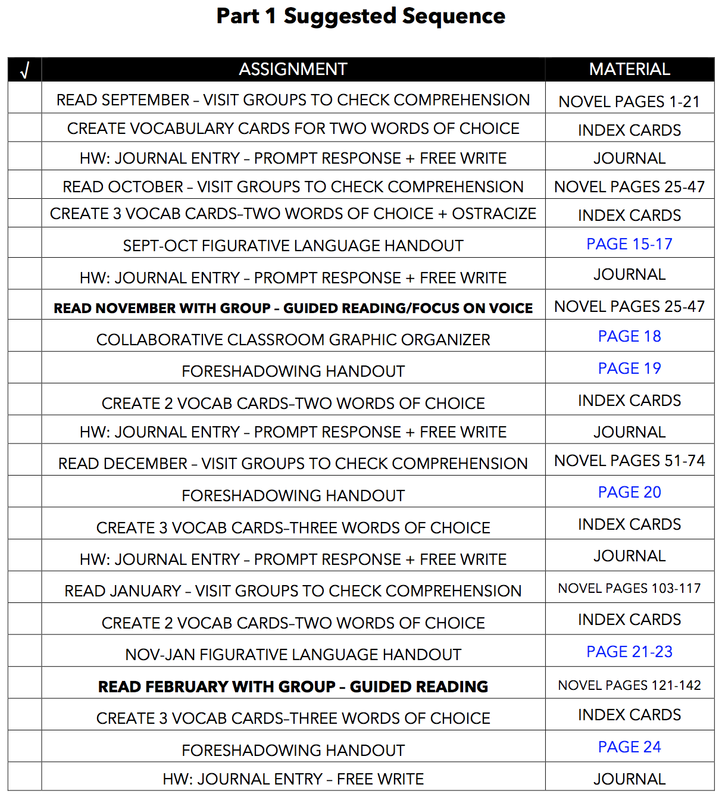 Excerpts and links may be used, provided that full and clear credit is given to Celeste Caso and 5th Grade Files with appropriate and specific direction to the original content. 5th Grade Files by Celeste Caso is licensed under a Creative Commons Attribution 4.0 International License.